Call me old fashioned, but I still hand write my thank you notes and refuse to rely solely on Facebook to wish someone close to me a happy birthday. While every generation has a different way of expressing itself, the practice of hand writing notes does not have to become a lost art. I am completely obsessed with Scalamandre's Zebra collection. Ever since I saw Wes Anderson's "The Royal Tenenbaums", I imagined one day having a foyer that I would grace with the iconic red zebra wallpaper. The closest thing I can get right now is sending notes that are reminiscent of the design. You can't go wrong with monogram stationary - paper is one of those things that can always be embossed without being overdone. For fun pops of color try mixing your initials with a text bubble or a hot pink pagoda. Rifle Paper Co. is my go-to for fun paper options. A gold foil stripes "Thank You" is a simple yet modern way to show your gratitude. I've found out the hard way that graduation cards are hard to find any other time but the end of spring. The result was sending a December college grad a message of congratulations without the cap and gown. This tiger is a perfect example of a unique graduation card, which could also be sent to someone starting a new job. 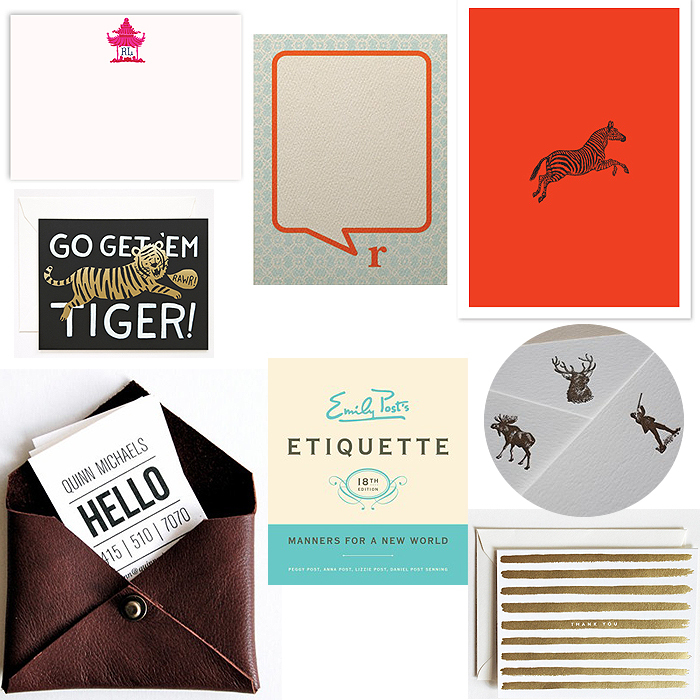 How do men find stationary amongst a slew of feminine designs? Stags, moose and manly hunting dudes are about as masculine as you can get - pretty darn southern, too. If I was a parent sending a child out into the world post high school, I'd gift them a set of personalize calling cards (also called social cards). Odds are they won't have a business card just yet, yet they will have tons of opportunities to network with future employers. These also work great for people between jobs or even a stay at home mom who wants to share their information in order to setup a new playdate. Emily Post knew what she was talking about years ago, but what about today? Her daughter, Peggy Post, updated her classic, which provids modern day etiquette on when to pick up that paper & pen and put away the laptop. Don't forget the unique way to personalize the outside - stamps! 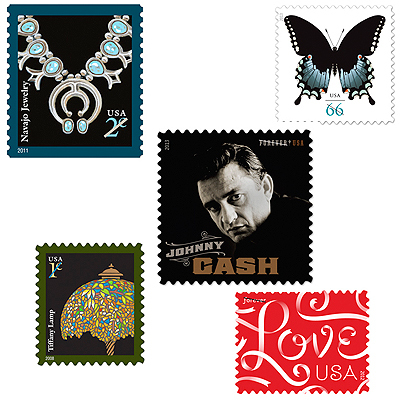 I like to stock up on my favorite forever stamps to keep on hand for holidays, special occassions, etc. Knowing they will never expire takes the pressure off having to use them before the next postage increase. For larger cards, the 66 cent butterfly is a great option, or use my favorite 1 & 2 cent stamps to add up to the correct postage for a more vintage look. Do you still hand write notes, or is the annual Christmas card the closest you get to snail mailing anything personal?